Beautifully engraved uncancelled $1000 gold bond certificate from the Imperial Government of Russia for the Wladikawkas Railway Company issued in 1900. This historic document has an ornate border around it with a vignette of the Romanov Seal. This item has various signatures of the Government and Company, and is over 112 years old. 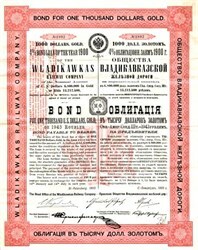 This bond was issued by the Wladikawkas Railway Co. in St. Petersburg in 1900 and was guaranteed by the Imperial Russian Government for the payment of interest and principal. The face value of the bond, payable in gold, was $1,000. The coupon yield was 4%, or $40, payable for up to 56 years. The bond promised that proceeds were exempt from every Russian tax, present or future. Sometime before 1920, the company stopped making interest payments.